The project maintainers release Kraft version for productive use. Today the stable version Kraft 0.82 was released (Changelog). It is a bugfix release for the 0.80 release. In addition to a lot of bug fixes, it also brings a few new features. Allow emailing through xdg-email and not only through thunderbird. To enable, set mailUA=xdg in the config file in the system section. Thanks to all who contributed to Kraft! It is recommended to update to Kraft v0.82. Today the stable version Kraft 0.81 was released (Changelog). It is a bugfix release for the 0.80 release, which is proofing it as stable since a couple of month already. Use QProcess rather than calling system(). Do not show individual tax on the document if there is only one tax rate used. Thanks to all who contributed to Kraft! It is recommended to update to Kraft v0.81. I am happy to announce the release of the stable Kraft version 0.80 (Changelog). After more than a dozen years of life time, Kraft is now reaching a new level: It is now completely ported to Qt5 / KDE Frameworks 5 and with that, it is compatible with all modern Linux distributions again. KDE Frameworks 5 and Qt5 are the best base for modern desktop software and Kraft integrates seamlessly into all Linux desktops. With KDE, Kraft makes use of the great PIM Addressbook infrastructure of KAddressbook and Akonadi. Kraft makes broad use of the core Qt5 libraries. The required KDE dependencies were reduced to a bare minimum. Akonadi libraries, which enable KDE PIM integration are now optional. The former dependency on heavyweight web browser components were completely removed and replaced by the far more simple richtext component of Qt. All these changes make it not only easier and more transparent to build Kraft but allow a port to other platforms than Linux more easily in the future. As Akonadi is optional now, Kraft can be built without it. Even if it was built with, but Akonadi for whatever reason is disfunctional, Kraft still runs smoothly, and only lacks the convenience of address book integration. The Address book access was also nicely abstracted so that other Addressbook backends can be easily implemented. Even though the functionality and GUI of Kraft was not changed dramatically compared to the last stable KDE 4 version, there were a few interesting changes in the user interface. A new, bigger side bar simplifies navigation. In the timeline view, a click on years and month in the treeview show summaries of the selected time span, ie. the number of documents with financial summaries per month or year. A filter allows to limit the view on the current week or month. A countless number of bugfixes and small improvements went in. Also updates to the newer C++ concepts where applicable make the rather mature code base more modern and better maintainable. The Reportlab based document creation script was updated and merged with a later version. Installing Kraft on Linux is still a bit complicated for unexperienced users, and distributions haven't made a good job in the past to provide the latest version of Kraft. To make it easier to test, there is an AppImage of Kraft 0.80 available that should be runable on most modern distributions by just downloading a single file that can be started right away after having added the executable permissions. For permanent installations please refer to the Download page. This is the announcement of Kraft version 0.59 which was released today (Changelog). It is another bugfix release for the 0.5x line of Kraft which still depends on KDE 4 libraries. It fixes some bugs in the calculation of the overall sums of documents with moved and deleted items, which are severe under certain circumstances. Furthermore, the setup wizard got visible fixes in the database migration and also document copying was enhanced to take more from the original document. Also, if the doctype of an existing document is changed, Kraft now asks the user if the document ID should be changed as well. More on the system level, some memory leaks were fixed. Also some template variables were changed from German to English for consistency. Special thanks go to Andreas Wuest who helped with feedback and patches to push Kraft on. It is recommended to update from previous versions. Please consider to contribute to the Kraft project by submitting your thoughts, feedback and bug reports. Herewith I like to announce Kraft version 0.58 which was released today (Changelog). It is another bugfix release for the 0.5x line of Kraft. It fixes a severe bug in calculation of the VAT in printed documents. Apart from that, the character slash ('/') now can be used in numbercycle templates which did not work before. In addition to that, I cleared the build process a bit and removed the libkraftcat from the build. The files are now all directly compiled into Kraft. The lib was never publically announced nor stable, or used at all, so there was no reason to keep it. Packaging is easier and more distribution conform now. This is the last bugfixing release for the 0.5x series. This releases fixes serious bugs of previous versions. The send-by-email function now queries the receipient (prefered email) off the documents contact data, and also works properly again with the thunderbird mail client. Special item types in a document (on-demand or alternative items) can now be removed again from an item. Also the Ok/Cancel handling of the document editor window was fixed. If the document type of an existing document is changed, the doc ID is now reset from the document type specific number cycle. Apart from that, a couple of memory management hickups were repaired which lead even to crashes here and there. A compile fix to make Kraft build against the latest version of the ctemplate library. A severe problem of Kraft in PDF document generation which made printing impossible. This version comes with an impressive list of new features and bug fixes. First and foremost, Kraft now supports another document type, which is the note of delivery. These kind of documents do not have prices on it, but just a list of articles which are going to be delivered. Kraft now comes with predefined document templates which allow to create these kind of documents out of the box. Apart from that, Kraft got a more robust way of querying the KDE address books through Akonadi. Before version 0.54, Akonadi had to have the nepomuk indexing activated to have a successful connection between Kraft and the address books. This has been changed and now, with newer KDE versions, Kraft uses an easier, faster and most important, more reliable way to retrieve addresses. Also new in this release is a utility called findcontact. It allows to query address data on the command line based on the UID. This utility makes it easier to build integration solutions based on Kraft documents. A ton of bugfixes also went into this nice release, so that everybody should update and have more success with Kraft! This is Kraft release 0.53. It fixes another problem a user reported against 0.52: Sub chapters of catalogs could not be dragged and dropped to top level, this is working now. Please update. Here is the next release of Kraft, version 0.52. It fixes the problem that the previous tarball 0.51 did not contain the source revision that it should have and was not properly working. Version 0.52 fixes that. Please update. I am happy to release Kraft 0.51 today. This is a bugfix release which brings a handful of useful bugfixes which were reported by Kraft users since the last release. In the catalogue view, now drag and drop is working to rearrange templates. Removing of sub chapters is also working now. A bug in the unit handling was fixed that picked wrong units in some cases. The path to document templates is not utf8 save. As a new feature the own identity now can be picked from Krafts settings dialog. Thanks for your interest and contribution to Kraft. Please help us with your feedback. 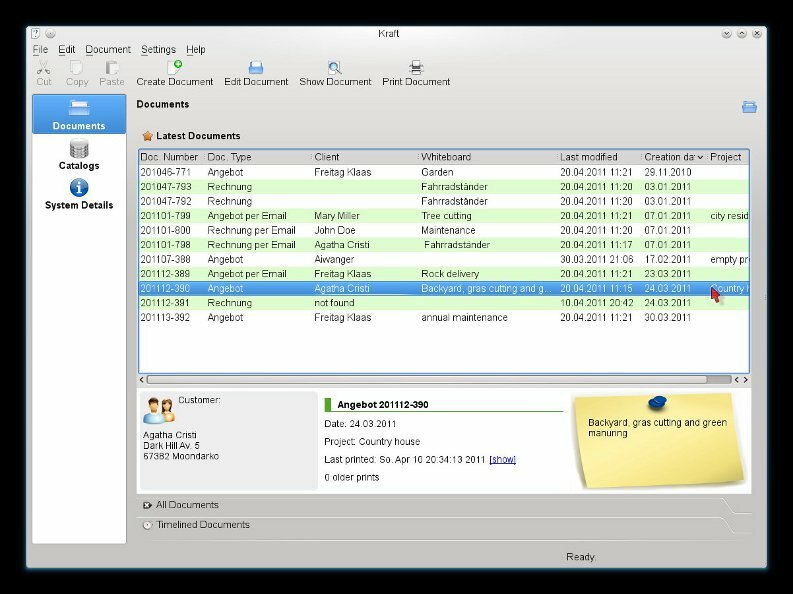 I am happy to announce the release of version 0.50 of Kraft, the KDE software for easy business document management. The most important change is that now multiple tax rates are supported within one document. That means that within e.g. one invoice items without tax, with reduced or full tax rate are supported. The sum calculation takes that in consideration properly. That makes Kraft an even more multi purpose software. Addressees can be added to a document even if the document already exists, not only if the doc is created. Documents display a page number on page two to end. On insertion of a new item to a document, the new item is focussed automatically. Manually added items can be added to the catalogue on entering again. The document type configuration dialog was reworked. The amount of processed SQL commands on setup is correct. Document saving is more performant. Improved error handling if Akonadi or the report generation fails. That eases debugging. Import of CSV-lists into the document was fixed. MySQL database setup is fixed. This release is a nice progress for Kraft and I hope you have fun and success with the new release. Thanks all who contributed to Kraft! I am looking forward to getting your feedback! A severe bug in 0.44 regarding the display of decimal places in the PDF document causes the generation of wrong documents. This is the reason for the release of version 0.45 today which only fixes this bug. Please skip 0.44 and directly go for version 0.45. We are happy to announce version 0.44 of Kraft, the KDE software to manage business documents in the small enterprise. This version brings a fully Akonadi based address book integration with many bug fixes and improvements in usage: Multiple address books are handled correctly now and can be chosen from within Kraft. The whole address selection widget was improved with search fields, a detail view of the selected addresses and direct access buttons to edit and add contacts. Furthermore the loading speed was improved tremendously. The text template widget from which the user picks template texts for header- and footer texts were also completely reworked. A lot of bugs were fixed, the guy was made more obvious and context sensitive help texts guide the user in his actions. The third big news is that Kraft now supports localized document templates by default. Kraft is installed now with a german and english template for offers and invoices. Other localizations are welcome. As usual a lot of other bugfixes and minor improvements went into this release. It is recommended for production environments. Please give feedback! Today, the Kraft team announces version 0.43 of Kraft, the KDE software to manage business documents in the small enterprise. This is a quick follow up release to verion 0.41 which was released in april 2011. It adds further improvements to Kraft's lists of documents and comes with a more optimized underlying model. The most visible change is that the search field for the document digest lists is back again. We wish a lot of fun with Kraft. Please give feedback, read details about that on the Contact Page. The Kraft team is happy to announce version 0.41 of Kraft, the KDE software to manage business documents in the small enterprise. This version contains large changes on the item template catalog handling. Catalogs can now have an arbitrary depth of sub chapters. The sequence of templates within the sub chapters is user editable. Templates can be moved around within the cataloges using drag and drop. Sub chapters can be transfered to documents with one click now. Furthermore, deletion of templates was added. completely based on the model/view implementation of Qt which results in a large speed improvement. The document details of a selected list entry are displayed in a more userfriendly view. PDFs of the documents are created utilizing the ReportLab RML library. The script that converts RML to PDF was completely reworked so that it now depends on python only which simplifies dependencies and the port to other platforms. Furthermore a lot of bug fixes went into Kraft, especially in the area of the KDE addressbook integration, text template handling and more. The Kraft team is happy to announce the new stable version 0.40 of the KDE office software Kraft. Eleven month of work resulted in Kraft 0.40 as the first version based on the KDE 4 software platform. Many changes to the codebase of Kraft where made to benefit from the new technologies introduced with KDE 4. The latest version of Kraft comes with only minor changes in the set of features compared to the KDE 3 version, as the focus was integration to KDE 4 data management. The changes are aimed to make Kraft even more convenient to work with for beginners. There is a new setup assistant that starts automatically on first run of Kraft. It reads the database details, creates and populates the database layer automatically. Furthermore, Kraft now supports SQLite as an embedded database backend in addition to MySQL. Both improvements make the setup of Kraft even more easy. We are also happy to announce a new project homepage available here. It is a new technology base to write better documentation and make it available. We wish you a lot of fun and success working with Kraft 0.40 on the KDE 4 platform. We are looking forward getting feedback from you on your Kraft experience. Please find the details on the Contribution page.